The Burren and Cliffs of Moher Geopark believes that the sustainability of the businesses within a destination along with the sustainability of products and experiences they offer are critical to the sustainability of the destination as a whole. 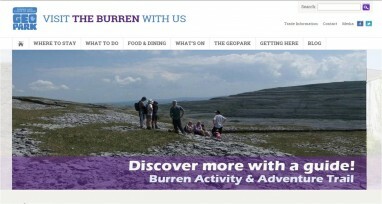 The Geopark has partnered with the Burren Ecotourism Network to develop the region as a sustainable tourism destination. 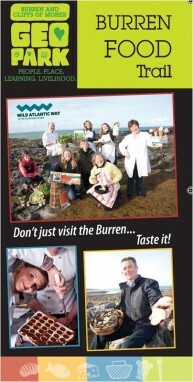 The Burren Ecotourism Network is a network of tourism businesses who share the vision of establishing the Burren as a premier internationally-recognised sustainable tourism region, ensuring the future economic and social growth and sustainable development of its communities, environment and heritage. The Burren Ecotourism Network has set the Geopark Code of Practice for Sustainable Tourism as a minimum level of training and accreditation that each business wishing to join the network must achieve. The Code of Practice includes 10 key points of environmental good practice which include waste, water and energy and waste-water management as well as conservation, interpretation and visitor communication. The Burren Outdoor Adventure and Activity Trail features some of the region’s most knowledgeable guides alongside some great family attractions. Both offer excellent interpretation and experiences in the unique landscape of the Geopark. The Burren Hostel Hop is an experience that allows the visitor to explore the landscape at their own pace either on foot or from a bike, stopping in each of the regions hostels while their bags a transferred on.